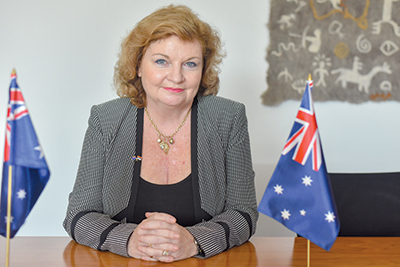 AUSTRALIA’S AMBASSADOR: worrying trend Albanian Nazi statues in Macedonia – Alternate Comms. Australia’s Ambassador to the Republic of Macedonia, Ms Julia Feeney, said there are “worrying trends” about the rise of neo fascism in Europe in response to Australian-Macedonian concerns over Albanian Nazi collaborator statues that have popped up in Macedonia in recent times. “We are concerned about the rise of new fascism and extremism wherever it occurs and agree there are some worrying trends in Europe at this time,” she told TEAM UZUNOV blog. 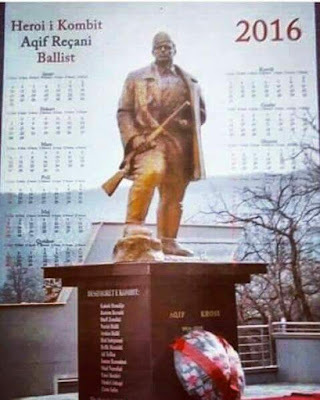 A TEAM UZUNOV blog investigation (see links here and here) has uncovered two statues “honouring” World War II Nazi collaborators built by Macedonia’s ethnic Albanian political bloc – the first in 2006 and the second in 2015. So far the Germany Deputy Ambassador Marco Aquatacci and the Council of Europe, the continent’s peak human rights watch dog, have reacted to concerns – put by TEAM UZUNOV blog – over these statues but there has been silence, so far, from the Macedonia’s Deputy Prime Minister Mr Bujar Osmani, from ethnic Albanian nationalist party DUI – a coalition partner of Prime Minister Mr Zoran Zaev’s government – the US Ambassador to Macedonia Mr Jess Baily, and NATO Secretary General Mr Jens Stoltenberg amongst others. 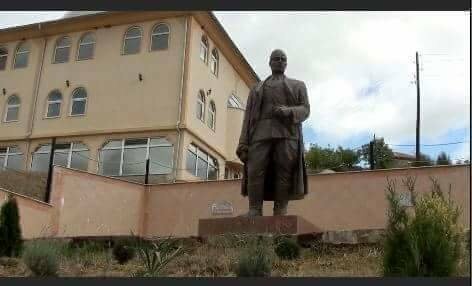 The controversial Albanian “Nazi collaborator statues” in the Republic of Macedonia. Top: Xhem Hasa in the village of Simnica, near the town of Gostivar. Bottom: Aqif Krosi Recani in the village of Recan, near Gostivar. Both figures were leaders of the Albanian nationalist militia Balli Kombetar in western Macedonia during World War II. The Balli Kombetar collaborated with Nazi Germany in conducting of ethnic cleansing of native ethnic Macedonians as well as murdering Albanians opposed to fascism. According to US author Richard Raschke, the Balli Kombetar’s overall leader Midhat Fraseri was actively involved in the Holocaust against the Jewish people. Many native ethnic Macedonians sees this as a poorly disguised attempt to erase their identity and name and are angered at this targeting since they have been victims of Greek, Serb and Bulgar colonialism beginning in 1912-13 with the partition of their traditional homeland. The part under Serbian colonial rule became a republic – de facto Macedonian nation state – in Tito’s federal Yugoslavia after World War II. In 2001 the Kosovo Liberation Army invaded Macedonia in an attempt to take territory and create a Greater Albania but it was foiled by the country’s security forces – police and army – after being initially on the back foot. Australian Macedonians will be holding nation wide rallies in the major cities – Sydney, Melbourne, Perth – on Sunday 4 March in support of Macedonia’s name and identity. 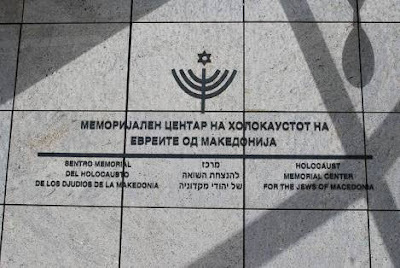 Jewish Holocaust Centre, Skopje, Macedonia. 2011 – A museum dedicated to the memory of the Jews of Macedonia who perished in the Shoah has been inaugurated in the former Yugoslav republic, in the presence of the country’s president and representatives of international Jewish organisations, including the World Jewish Congress (WJC). In his speech, the WJC’s Research Director Laurence Weinbaum pointed out that no Jewish community in Europe had suffered a greater degree of destruction than the Macedonian one. SERB MONARCHIST STATUE FOR MACEDONIA?